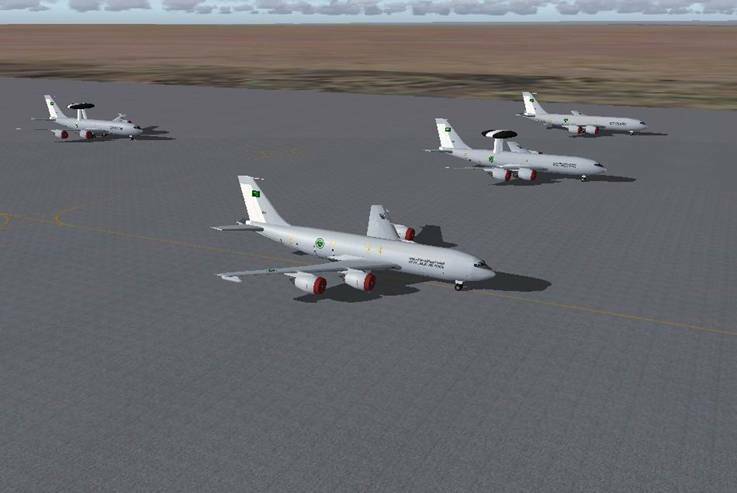 This freeware AI package, produced by Military AI Works, contains everything needed to fully activate RSAF E-3A(AWACS) KE-3A(Tanker) RE-3A(Elint) traffic. 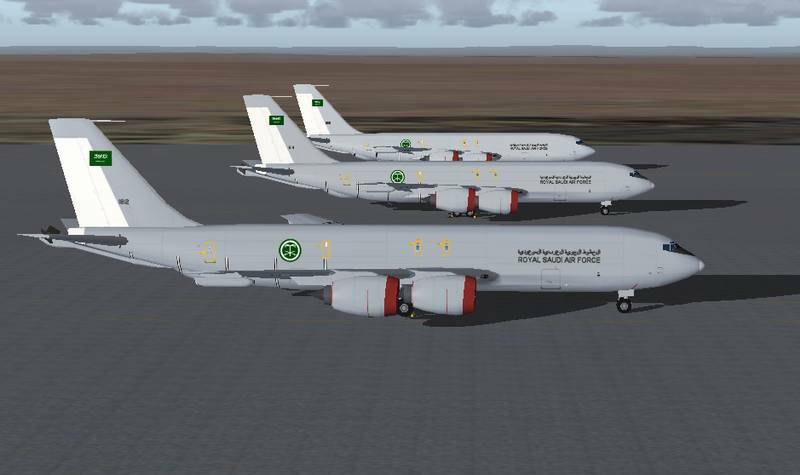 Package contains afcads, flightplans (all current E-3A(AWACS) KE-3A(Tanker) RE-3A(Elint) Squadrons and custom voice pack call signs for RSAF. I have shied away from repetitive hourly plans as in true life many modern air forces don’t work or fly at the weekends on a regular basis, therefore the utilization in these plans is relatively low but probably reflects real life actuals. All plans are works of fiction. NOTE: Failure to remove these duplicate files may result in problems with AI aircraft parking and operation. It is recommended you move these to a temporary folder instead of deleting them; however, you should not need them again as the AFCADs included in this package are thoroughly researched and highly detailed. 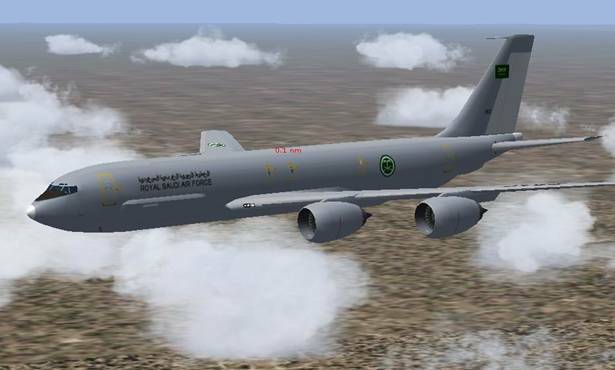 If you are using add-on scenery for one of the above airfields, it is recommended you do NOT remove the AFCAD for the add-on scenery, but instead remove the MAIW AFCAD file (e.g. MAIW_XXXX_DEFAULT.bgl) after installation. NOTE: There will also be some exclude files installed for the above. These are labeled MAIW_exc_XXXXXXXXXXXX. These remove autogen scenery items (ie. trees, etc.) that may impinge on taxiways, etc. 2a) If you don’t have the EditVoicepack 3.1 freeware installed, download it and install it by clicking here. Files may be named in several ways. The most common are “AF2_KXXX.bgl,” “AF2_KXXX_DEFAULT_XX.bgl” and “PAI_AF2_DEFAULT.bgl.” Keep the file names starting with MAIW and remove all others with duplicate airport identifiers. The flightplans are fictional, but have been researched via Internet and message forums. 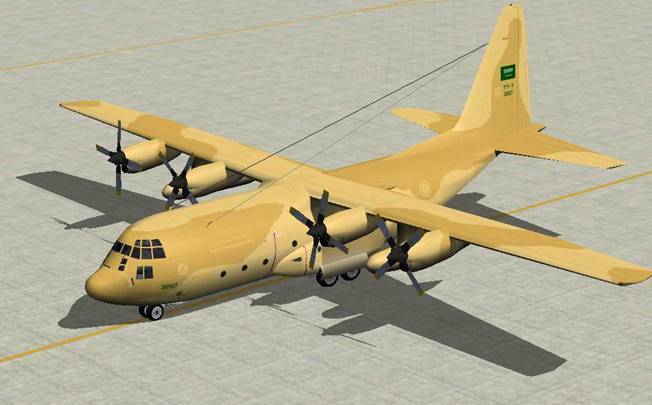 We have tried to make the plans as “realistic” as possible, but as the RSAF do not publish their weekly plans we have had to use our own judgment! All flightplans were created using Notepad. Flightplans were installed using Lee Swordy’s TrafficTools freeware traffic compiler. The callsigns used in this package are actual callsigns used by these units, based on information obtained in manuals and on internet. Upload to FSPLANET.com will never be allowed by Military AI Works. Any questions, suggestions and feedback on the contents may be directed to the forums at www.militaryaiworks.com.